BIRDMAD: Wood sandpipers are handsome birds. Crossness Nature Reserve, London. Wood sandpipers are handsome birds. Crossness Nature Reserve, London. 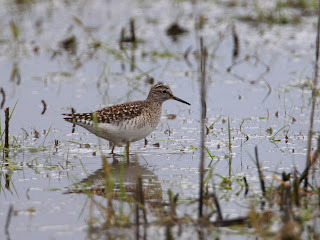 On Sunday I went to Crossness Nature Reserve in South East London where some wood sandpipers had been seen. At first it was difficult to know where they were. I am a member but I couldn't get into the reserve itself as my code for the gate didn't seem to work. Then I met someone who showed me where they should be. We both scanned the flooded paddock but could see no wood sandpipers. The pager reported them at 0800 and it was now 0845! What?? I reported that there was no sign. A lady walking her dog also scanned the field with me but there was nothing to be seen. Then, a flock of 8 small waders flew overhead and away into the distance. They'd been there all the time! I waited around taking pictures of a distant wheatear and black redstart. Then the wood sandpipers came back and, of course, went into the most remote and inaccessible corner of the field. We watched them through scopes for a while and people then dispersed. I decided to ask the owner of a nearby field if I could go into the far corner for a better view. He was friendly and said I could go wherever I wanted. I managed to approach without disturbing the birds and got to within 25m. That was the high point of the day. I went home to join Lynne for lunch in a pub (Lynne was doing a charity walk) and then headed off to Arlington reservoir hoping to see red-rumped swallows. No such luck! They'd gawn! Elusive red-rumped swallows. I hate 'em!